Delicate designs in soft shades of pink and blue typically come to mind with Pima cotton layette. However, in 2015, mompreneurs Alissa Wapinski and Andrea Schneider challenged the norm with a modern update to the Peruvian-sourced material many parents adore with the launch of Baby Noomie. Available in sizes newborn to 8 years, the collection of vibrant colors, witty phrases and freehand graphics has added a fresh spin to the super-soft fabric. Wapinski says the Aventura, FL-based brand owes much of its success to fostering trusted relationships with its partners. “You can’t just sit and wait for people to call you,” she says. “It’s up to you as a brand to take the initiative to phone, email, exhibit, advertise—whatever it takes!” Wapinski also cites mommy influencers like Arielle Charnas, Tori Spelling, Hilaria Baldwin and Stephanie Gottlieb, as significant to building brand awareness. “Moms recommending other moms our product is incredibly powerful,” she says. Love Bubby empowers children with outspoken designs. 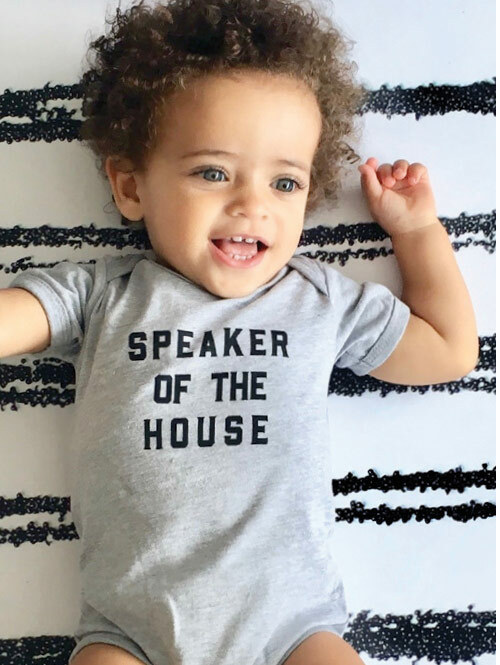 Made in the U.S. from 100-percent Airlume combed and ring-spun cotton, Love Bubby’s simplistic collection of baby one-pieces (SRP: $26) and graphic tees (SRP: $28) have business booming with bestsellers like Little Feminist, Speaker of the House and Always Fierce. This year, Windau is focusing on growing Love Bubby’s image. “We’re working on brand awareness with retailers and consumers,” she says, noting that she often uses hashtags like #TeachThemYoung for getting the word out on social media. Windau also sets an example with her marketing campaigns, always casting a diverse range of models.